A NEW STANDARD IN DIGITAL STAGE UNITS. The Roland S-2416 digital snake stage unit expands the line-up by offering a 24 input x 16 output analog and 8 input x 8 output digital, for a total of 32 input and 24 output channels. In addition to the analog and digital I/O the S-2416 has two REAC ports enabling the ability to cascade an additional snake for expanded I/O or for a fully redundant, zero-loss audio back-up solution. In addition, the discrete mic preamps are newly developed high-grade ensuring highest-quality uncolored sound. The chassis houses 24 analog inputs and 16 analog outputs in an EIA rack-mount size of 4U. All input sections are equipped with discrete mic preamps that have been freshly designed to be transparent with uncolored sound. What's more, each XLR jack features three-colored lights that clearly communicate the status of phantom power, clipping, and signal presence. The use of Neutrik connectors assures ruggedness for demanding environments. 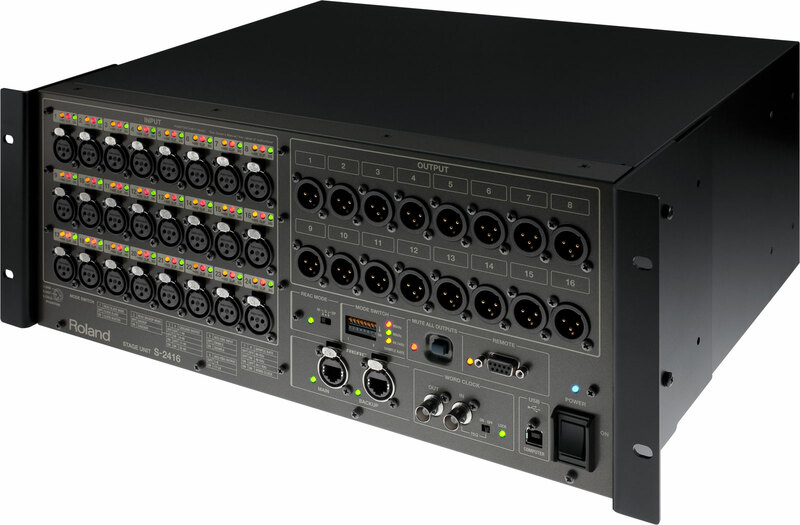 The rear panel provides AES/EBU connectivity (25-pin D-sub type) for 8 channels of input and output, enabling connection to speaker processors, amps, and other devices capable of AES/EBU input and/or output. Input via AES is assigned to channels 25 through 32 and output is selectable by a mode switch. When combined with analog input and output, the S-2416 can achieve up to 32 inputs and 24 outputs. *When using AES/EBU input/output, external syncing to a master clock is required. Use third-party AES/EBU breakout cables to make connections. With two REAC connectors – a main and a backup – a redundant REAC network is possible. If a problem occurs with the main line, operation instantly switches to the backup with no break up or click/pop in sound. What's more, use of Neutrik Ethercon connectors assures both a reliability and ruggedness for any type of environment. The S-2416 is the first Digital Snake capable of a cascade connection. Switching the device to Cascade mode and connecting another Digital Snake makes it possible to expand inputs and outputs up to 40x40 channels. Any of four patterns can be selected for the number of channels output to the additional Digital Snake with a cascade connection: 40 (1 - 40 ch), 32 (9 - 40 ch), 24 (17 - 40 ch), and 16 (25 - 40 ch). The S-2416 supports a high bit rate of 24 bits and a high sampling rate of 96 kHz. A mode switch enables selection of 96 kHz, 48 kHz, or 44.1 kHz, when the S-2416 is switched to Clock master mode. The unit is also equipped with word-clock input and output connectors (BNC) for supplying a master clock signal when using the AES/EBU connection. The S-2416 is equipped with a MUTE ALL OUTPUTS button to temporarily silence all outputs - a handy feature when changing cable connections. Mic preamps can be controlled using any V-Mixer, R-1000, an S-4000R unit connected by RS-232C, or by using the S-4000 RCS remote-control software on a computer (Mac or Windows) connected via USB. *S-4000RCS can be downloaded from proav.roland.com. Rack-mount angle brackets can be attached not only at the front panel, but also at the rear. This makes it possible to mount the S-2416 with either front or rear orientation as needed.